Peanut Butter and Chocolate are a match made in heaven to me! These are so amazing and delicious . 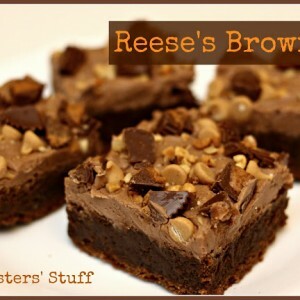 . . if you love Reese's, then you will love these! Combine melted butter and cocoa, add sugar, then eggs. Bake in glass 9x13" pan at 350 degrees for 22-25 minutes. Beat butter, whipping cream, water, and cream cheese in a bowl on medium speed until fluffy. Gradually beat in cocoa and powdered sugar until smooth. Sprinkle evenly over frosted brownies.